Offering you a complete choice of products which include rubberised rain capes. 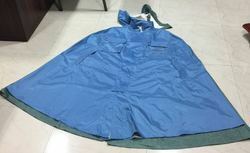 We manufacture rubberised nylon rain capes for various paramilitary forces (BSF, CRPF, SSB, ITBP, Assam Rifles, etc.) as per DGS&D specification no. G/Tex/Misc/43/ST/Rain Capes Nylon. Looking for Waterproof Rainwear ?